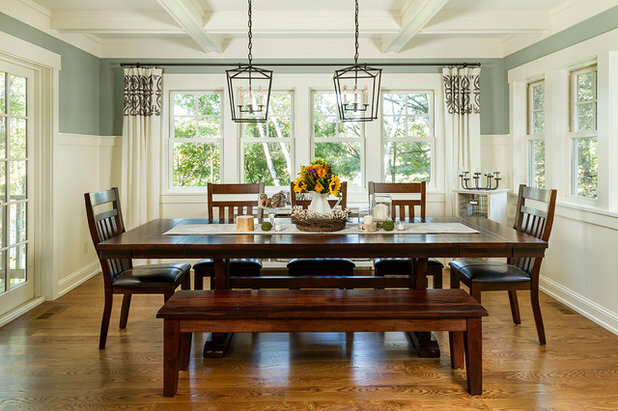 In today’s fast-paced world, scheduling time for formal family dinners isn’t always easy, but this collection of 50 stylish dining rooms just might open up a few calendars. To see the photos as a slide show, click the first image to enlarge it, then use the right arrow to flip through them all one at a time. 1. 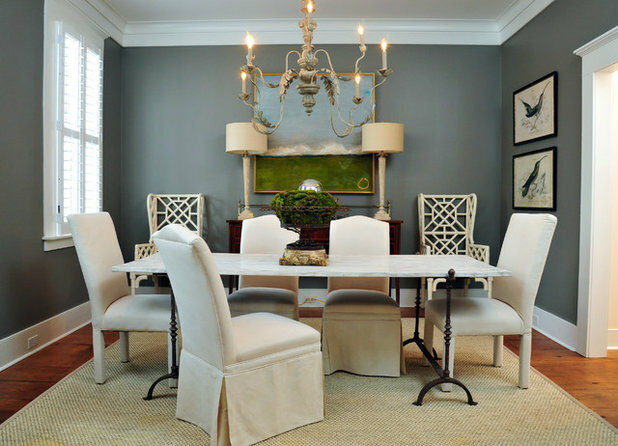 This elegant dining room was created by designer Jenny Peterson. 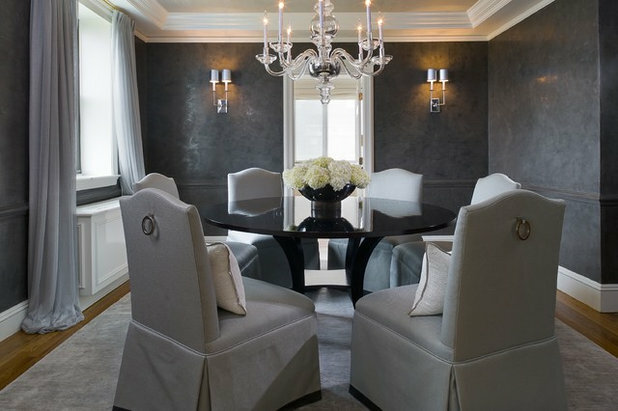 The space features eight tufted velvet chairs surrounding a dark wood oval dining table. 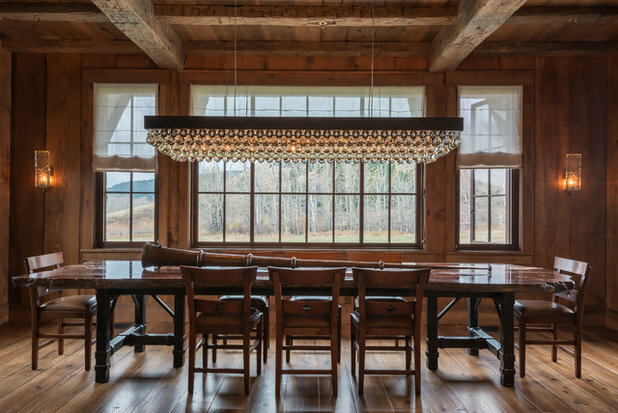 The light fixture above includes six blown-glass pendants on separate rods. 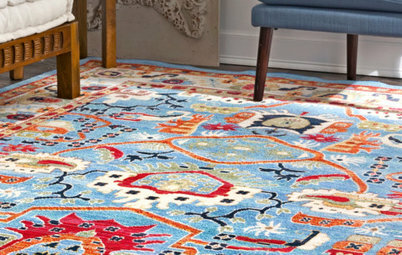 R. Scott Javore & Associates, LTD.
2. 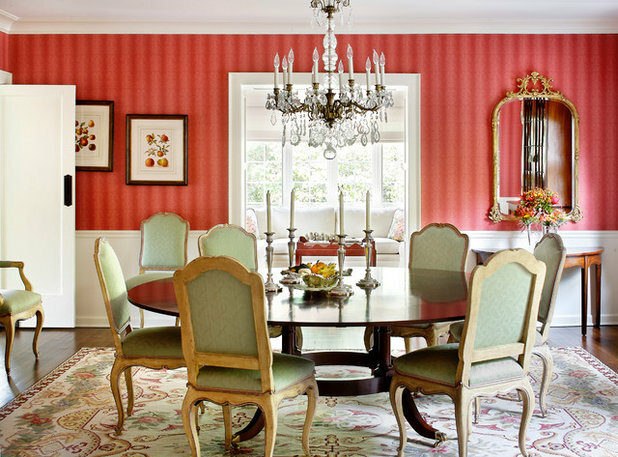 Striped red wallpaper, a dazzling crystal chandelier and antique dining chairs covered in a pale green upholstery combine to create a suburban Chicago dining room that feels traditional and fresh at the same time. 3. 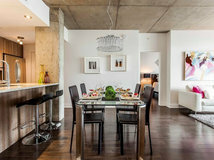 This dining room in Brooklyn, New York, created by the team at The Design High, includes wishbone dining chairs, a midcentury-inspired dining table and an industrial chandelier. But it’s the floor-to-ceiling world map on the back wall that provides the final touch. 4. The table in this traditional Atlanta dining room has rustic iron legs and an oak top in a pickled white finish. 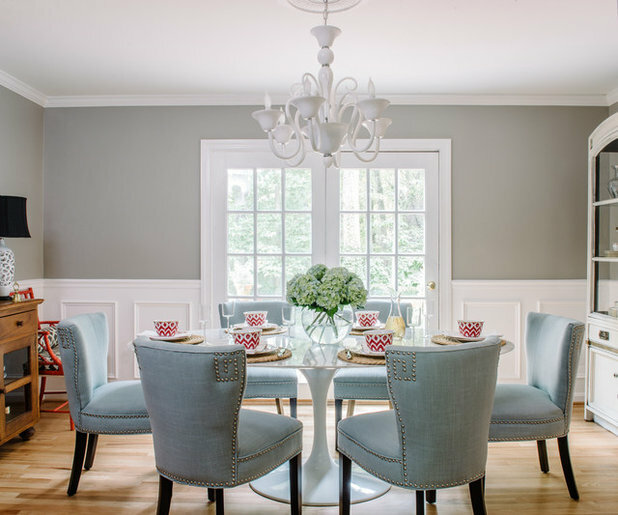 The pair of Chippendale chairs against the back wall were originally black, but the homeowner had them painted white. 5. Eating in the sunroom is an elegant affair in this classic New York home designed by Crisp Architects. The space features slate floors and black iron furniture that can be used inside or out. 6. 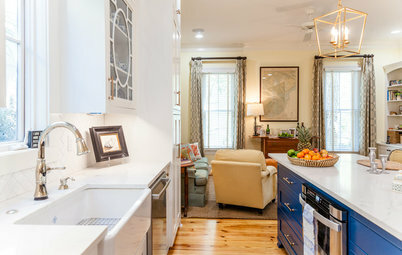 Designer Alison Giese says a crisp color palette and an eclectic mix of furniture styles keep this Washington, D.C., dining room feeling young and fresh. 7. 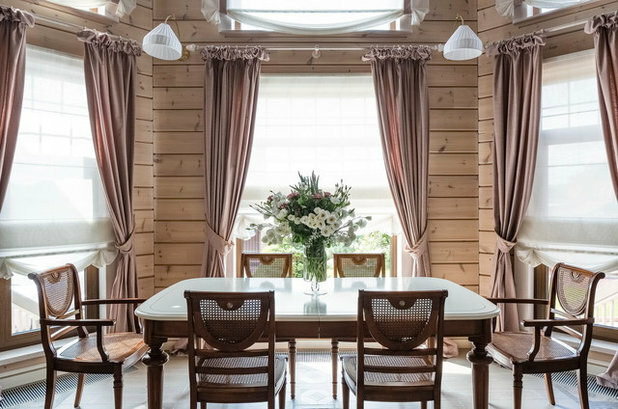 This wood-paneled dining room in Moscow was created by Xenia Design Studio. The cane-backed chairs and wood dining table with a painted white top stay true to the room’s brown-and-white color palette. 8. 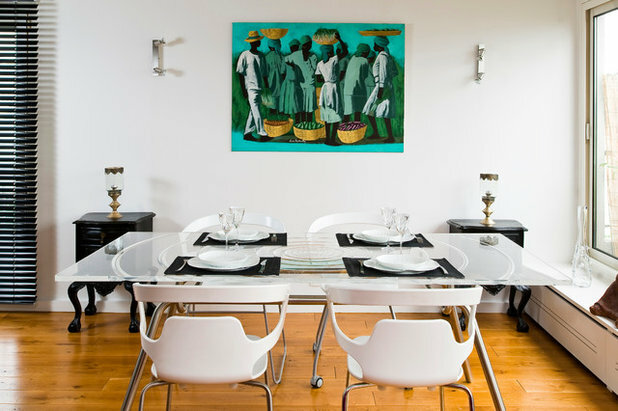 This black-and-white dining room in Paris would be a study in minimalism if it weren’t for the vivid oil painting on the back wall. The glass-topped dining table was designed by the project’s architect, Manuel Sequeira. 9. 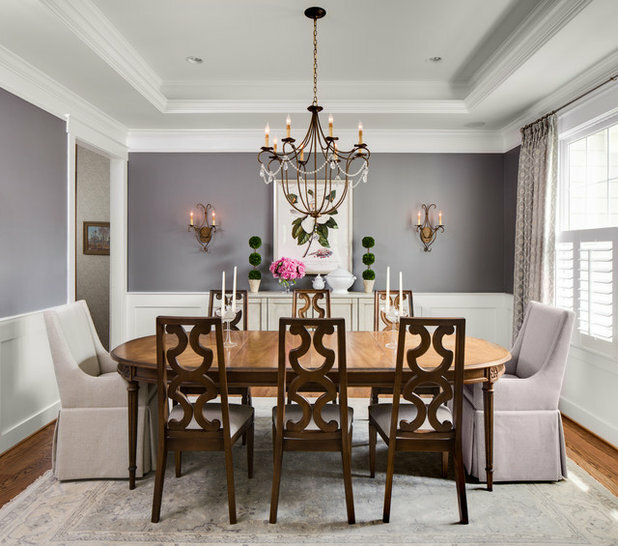 This elegant New York dining room, designed by Shelley Morris Interiors, features a painted fireplace and an Italian dining table, but it’s the stunning chandelier from Ochre that steals the show. 10. 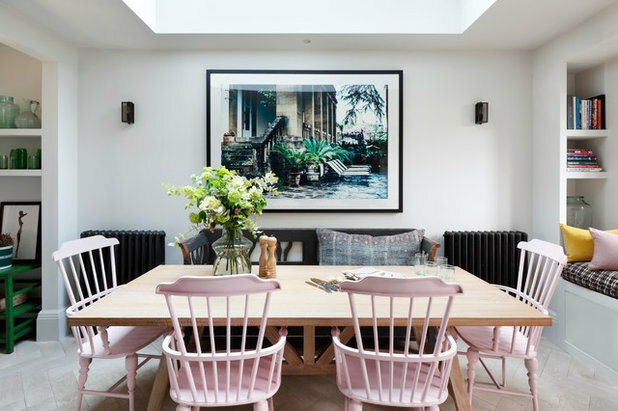 With its pink and mauve walls, painted white wood floors and pair of dyed sheepskin throws, this dining room in Denmark is about as sweet as it gets. 11. Designer Charmean Neithart says that the owners of this Los Angeles dining room wanted a cheerful beach vibe. 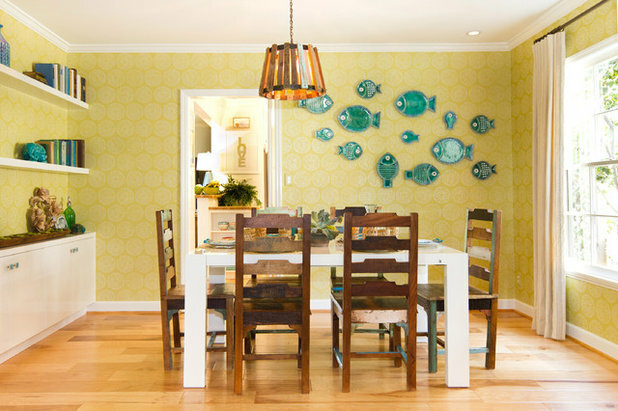 The yellow-wallpaper-covered walls feature a collection of Malibu fish plates that the designer hung in a playful arrangement. 12. 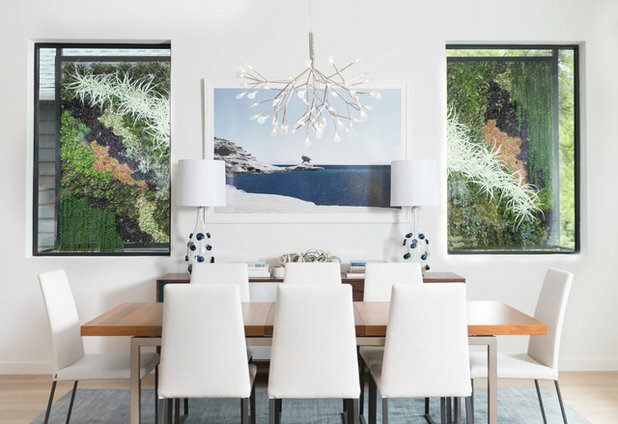 This coastal-chic Miami dining room, by designer Krista Watterworth, features white paneled walls, an ocean-inspired oil painting and a white Maarid chandelier from Feiss. 13. 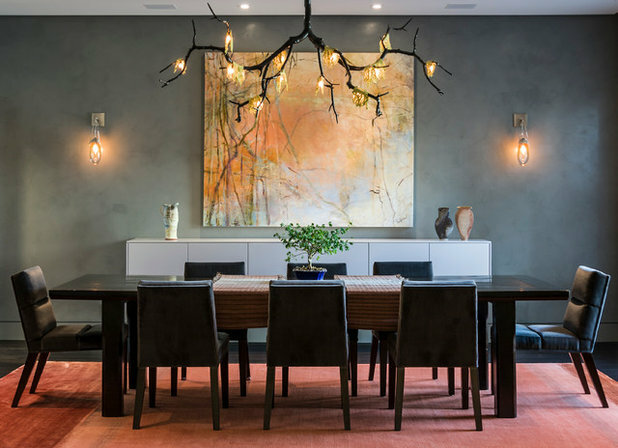 Designer Melissa Broffman says that she designed this Washington, D.C., dining room around the sculptural wood chairs, which the clients already owned. The chandelier and sconces are from Currey & Co.
14. The owners of this Chicago dining room already owned the painting featured on the back wall. The design team at Kaufman Segal selected a branch-inspired chandelier from Lightology to complement the art. 15. Artwork featuring Marilyn Monroe and two dazzling chandeliers make a bold statement in this midcentury-inspired dining room, created by Design Works. 16. 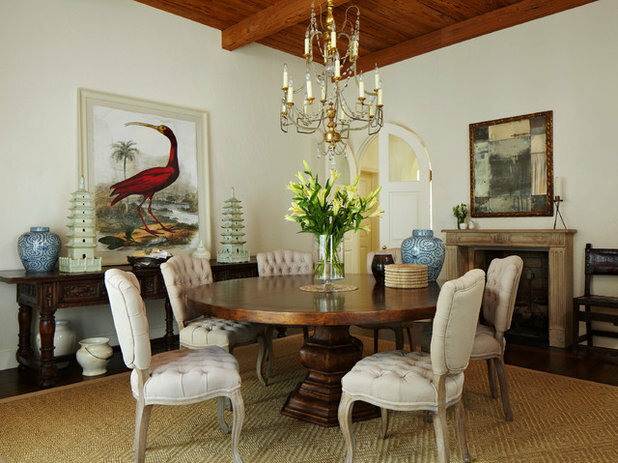 This eclectic dining room in Miami was designed by Katherine Shenaman. The space features an antique chandelier from Italy and a painting of a red ibis from Mecox. 17. This vibrant dining area in Manhattan’s Chelsea neighborhood features a custom built-in white tufted banquette. 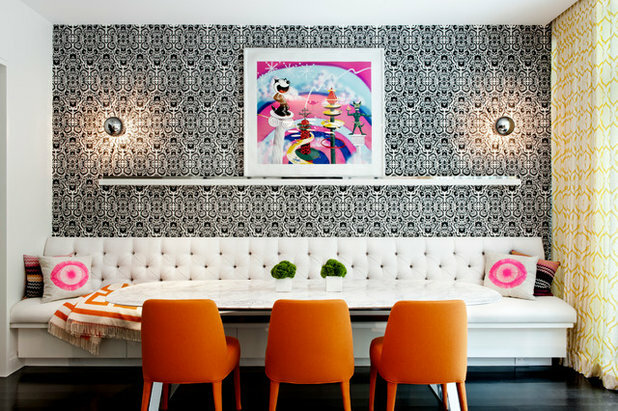 Black-and-white wallpaper and a trio of orange dining chairs are among the other highlights. 18. The design team at Alisberg Parker painted the wood-paneled walls, molding and ceiling here a rich charcoal. The emerald green curtains pop against the dark backdrop. 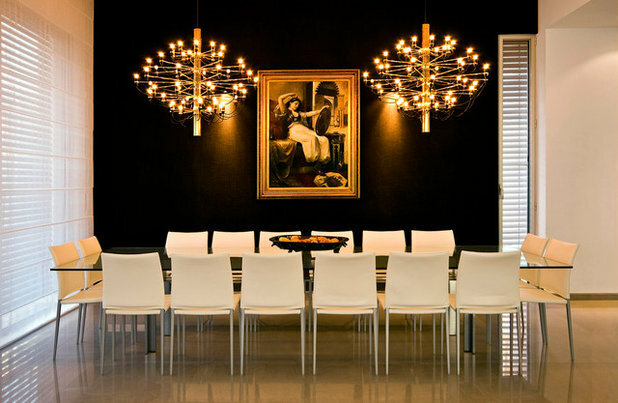 The antique wood table is surrounded by Lucite chairs with black leather seats. 19. The trio of Tom Dixon pendant lights in copper, silver and gold finishes create a modern contrast to the rustic brick wall backdrop in this London dining room, designed by Casey & Fox. 20. 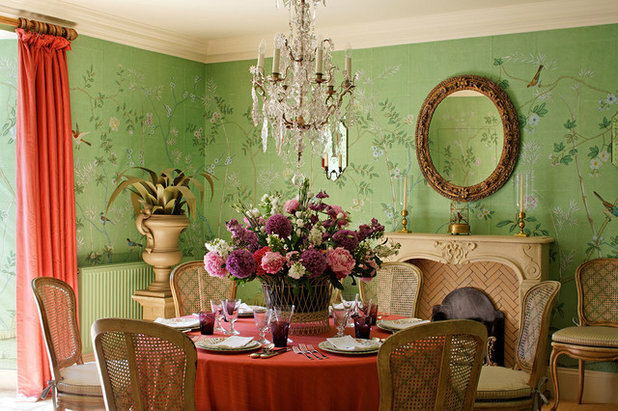 This traditional Berlin dining room, designed by Lars Leppin, features green wallpaper from de Gournay, a crystal chandelier and an assortment of antique furniture pieces that combine to create an elegant and timeless look. 21. 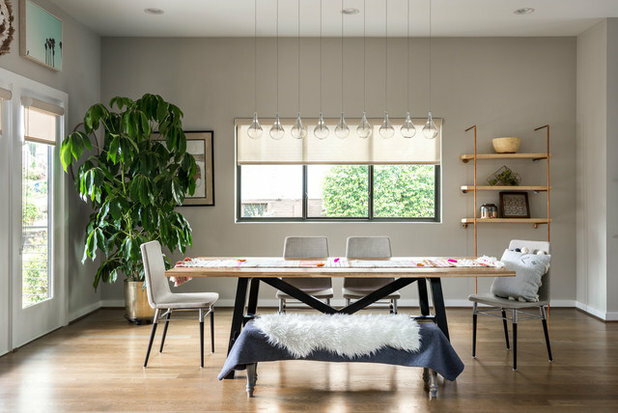 This updated bungalow in Los Angeles’ Hermosa Beach features a dining room that is a perfect marriage of Arts & Crafts and contemporary style. 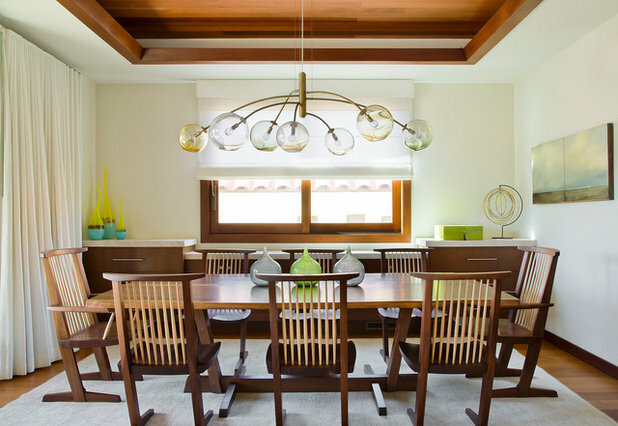 The new dining table and chairs were inspired by the works of Frank Lloyd Wright, while the stunning glass chandelier would look right at home in the most modern of spaces. 22. 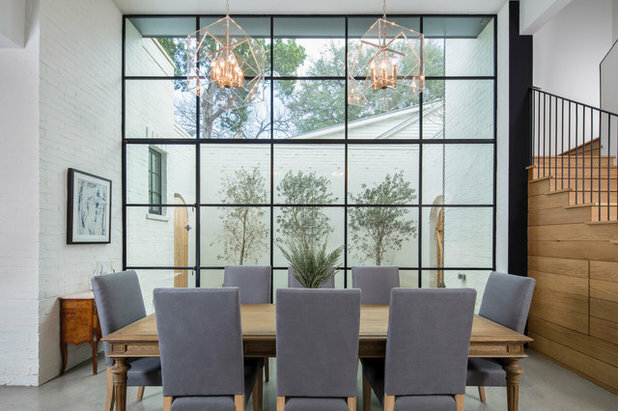 Narrow windows added to the top and sides of the back wall allow for natural light and views, but also plenty of privacy, in this Dallas dining room. 23. This London dining room, designed by Studio Duggan, is stationed underneath a large skylight. 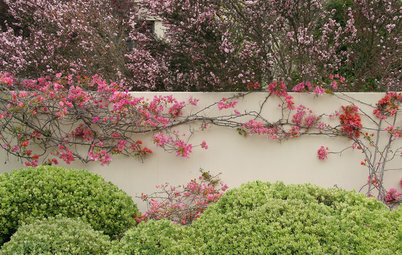 With the white walls, the space is ideal for showcasing artwork or colorful photographs. 24. 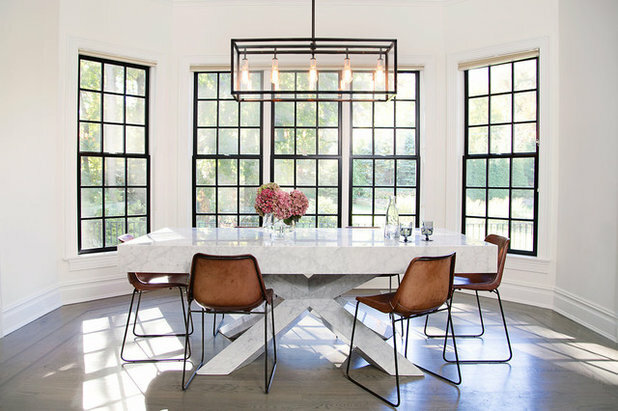 This black-and-white dining room in Houston shows that just one colorful piece can make a dramatic impact. 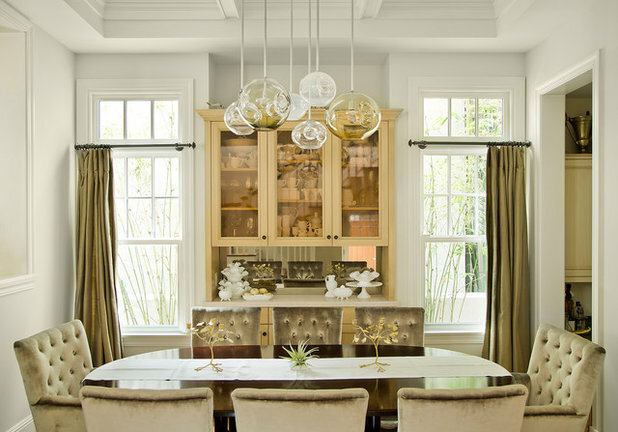 Here, the lime green glass chandelier from Lighting Unlimited draws immediate attention. 25. 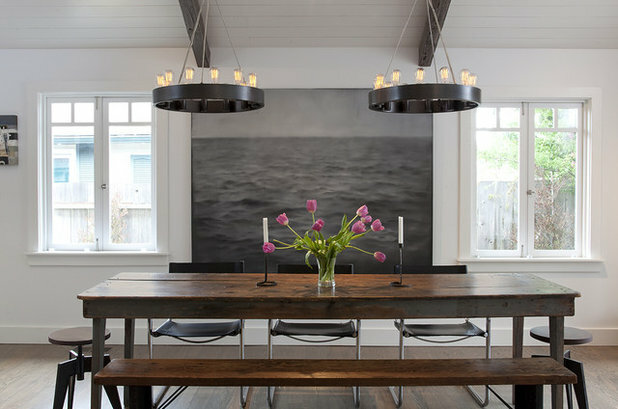 Designer Tineke Triggs outfitted this dining room in Marin County, California, with a reclaimed dining table and bench, a pair of stools and a trio of black leather and chrome Spoleto chairs. The artwork is by Eduard Resbier. 26. The charcoal gray walls in this dining room in Manhattan’s Greenwich Village neighborhood are covered in a mix of Venetian plaster and Benjamin Moore’s Day’s End. 27. 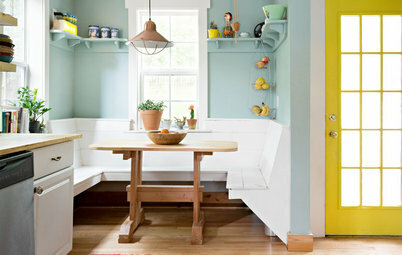 This farmhouse-inspired dining room keeps things simple with a bench and chairs surrounding a large rustic table. Details like the black embroidery at the top of the curtains and the green paint draw in the lush views. 28. 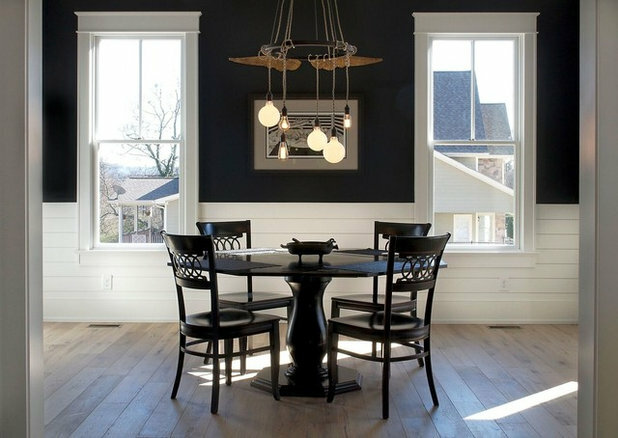 Black walls and an industrial chandelier from Schoolhouse Electric & Supply, mixed with barn-style wood flooring and shiplap wainscoting, create a modern farmhouse aesthetic in this Tennessee dining room. 29. 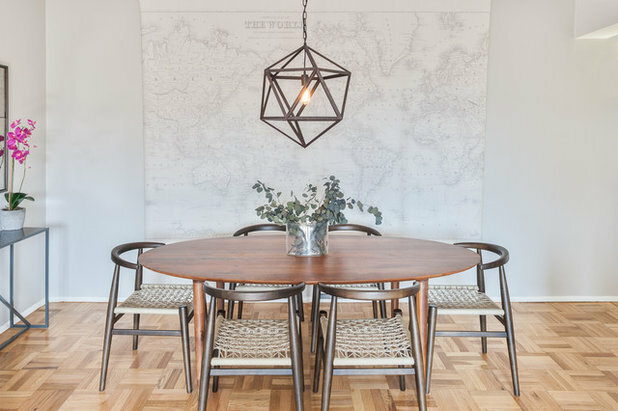 The large table in this Melbourne, Australia, dining room is equally suited for hosting a dinner party and a large study group with easy access to books. 30. 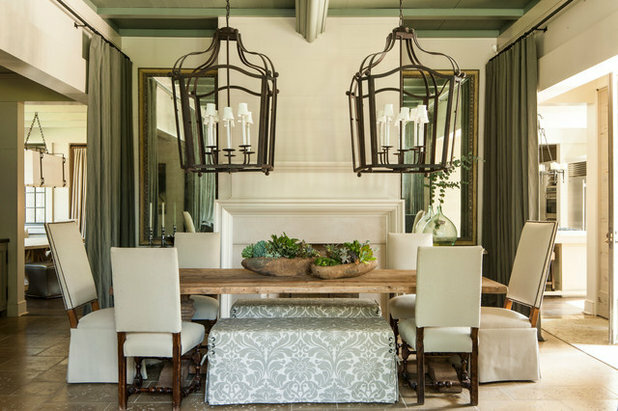 Designer Aly Daly created the table for this glamorous Los Angeles dining room. 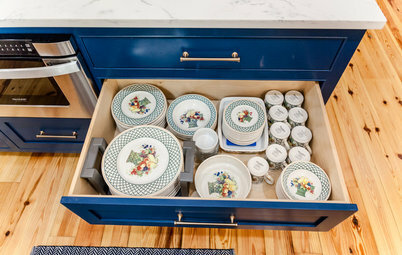 The tabletop is a salvaged door from Belgium that the designer painted white and encased in glass. 31. Light is even more luminous against a dark background, whether the night sky or a painted wall. Up the impact of a chandelier by painting the walls a rich, dark hue, like the wall in this dining room in Tel Aviv, Israel. 32. 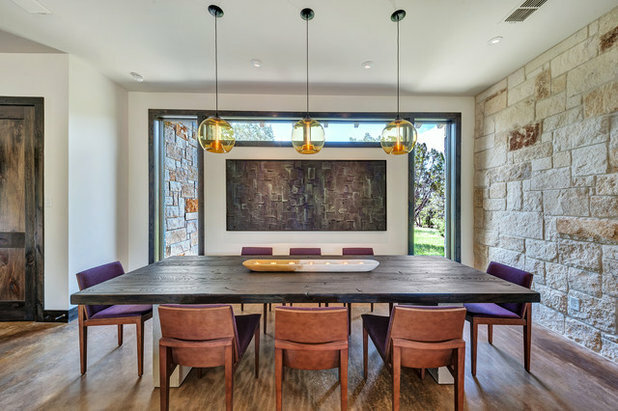 Floor-to-ceiling windows allow this home’s lovely courtyard to take center stage in this Austin, Texas, dining room. Note how the-glass encased chandeliers mimic the courtyard’s effect. 33. Rather than adding window shades to block out the neighbors, the designers of this Austin, Texas, dining room installed two vertical gardens outside to add privacy and a verdant view. 34. 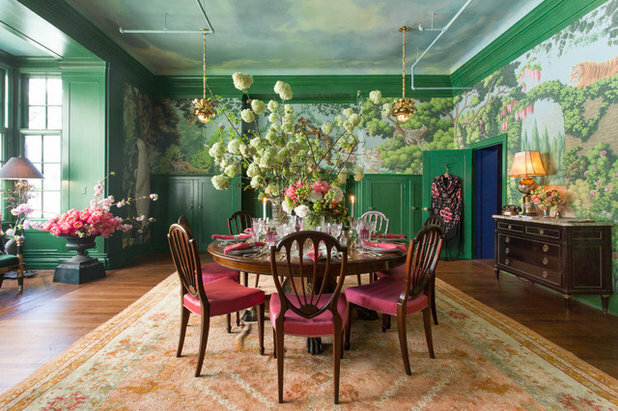 Designer Ken Fulk created this botanical-inspired dining room for this year’s Kips Bay Decorator Show House. 35. 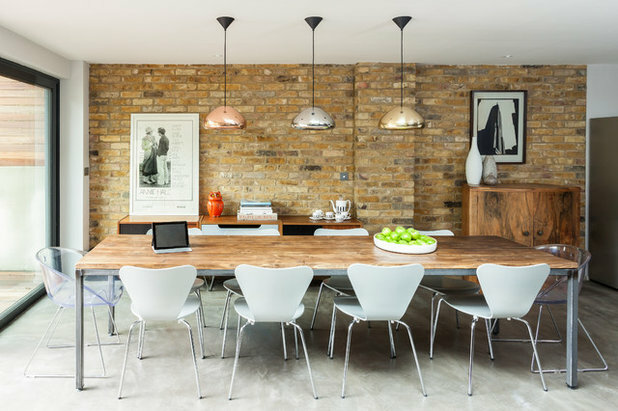 Three hanging mirrors and a series of exposed-bulb pendants add just enough visual interest without distracting from this London dining room’s original brick wall. 36. 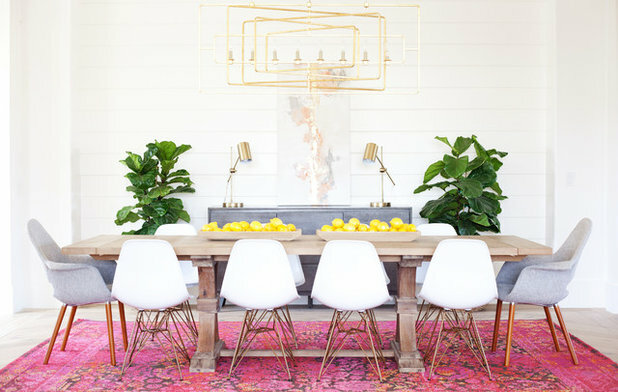 While the sculptural gold chandelier, molded plastic chairs and farmhouse table all create a well-edited dining room in Phoenix, the fuchsia Oriental rug creates a bold focal point that ties the space together. 37. 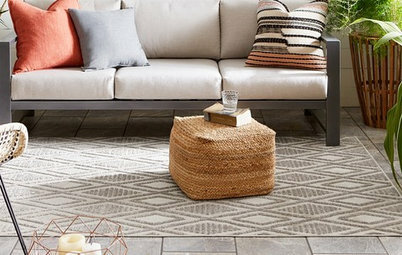 Large indoor plants are making a big comeback in interior design. This Atlanta dining room is a good example of the impact that a large potted plant or tree can make. 38. 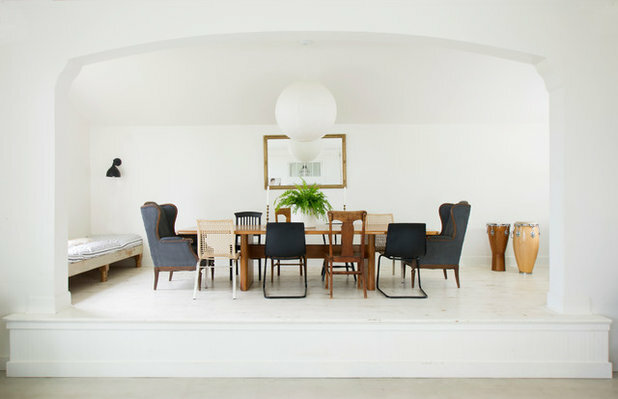 The massive marble dining table and leather chairs do the heavily lifting in this minimalist New York dining room. Note how the black iron chandelier mirrors the window frames. 39. 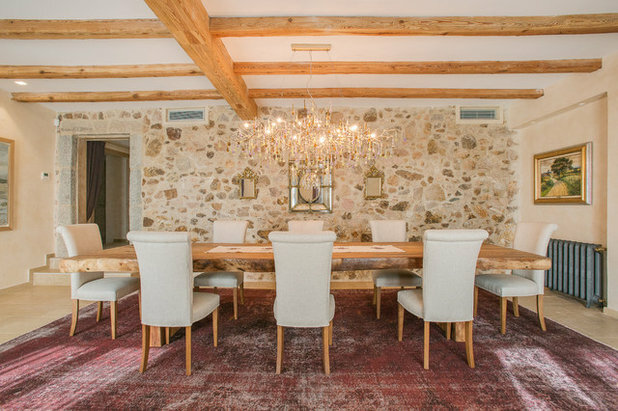 The twinkly chandelier adds a refined twist to this Spanish dining room with a stone-covered wall, timber-beamed ceiling and massive live-edge-wood dining table. 40. 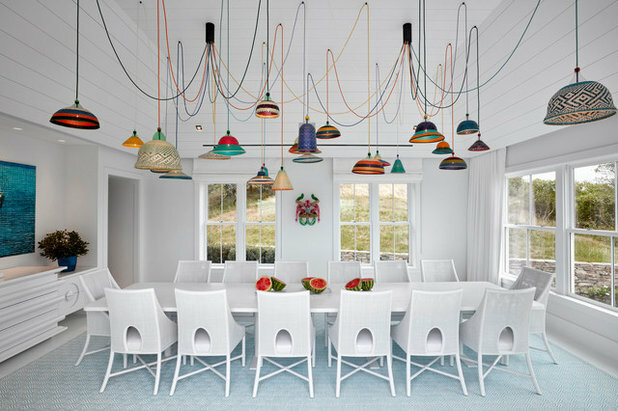 A rainbow of colorful pendant lights and equally colorful cords look striking against the whitewashed backdrop in this beach-inspired dining room in the Hamptons, New York. 41. If hosting a successful dinner party is similar to putting on show, then this San Francisco dining room has a leg up — it’s in an area that was formerly a school stage. 42. With one accent wall covered in an electric blue paint and another in a black-and-white graphic wallpaper, this Toronto dining room definitely stands out. 43. 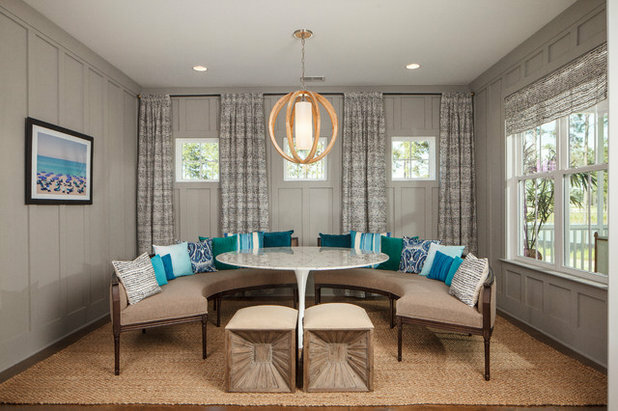 Two curved settees surrounding a round dining table give the look of a built-in banquette but with much more flexibility. 44. A wood alphorn from the Swiss Alps is used as a centerpiece for this rustic dining room in Montana. 45. 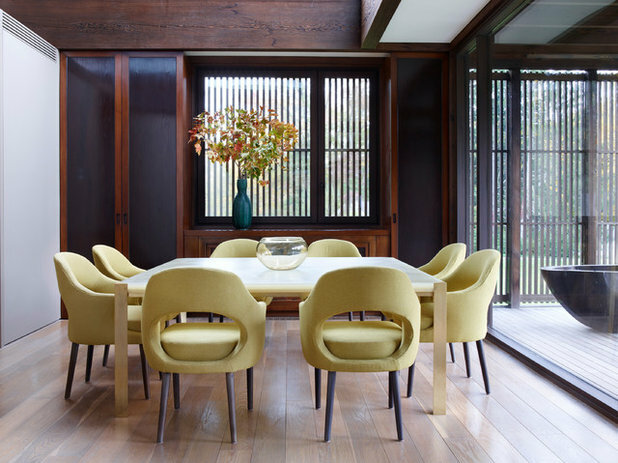 The design of this dining room in New York was inspired by traditional Japanese teahouses. The vertical slats over the window are a stylish way to filter light and add privacy. 46. 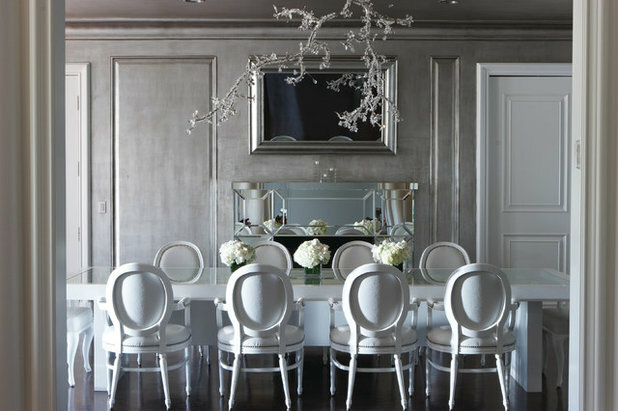 This monochromatic dining room in New York City is a great setting to feature art. An easel and a built-in bookshelf feature various works. 47. 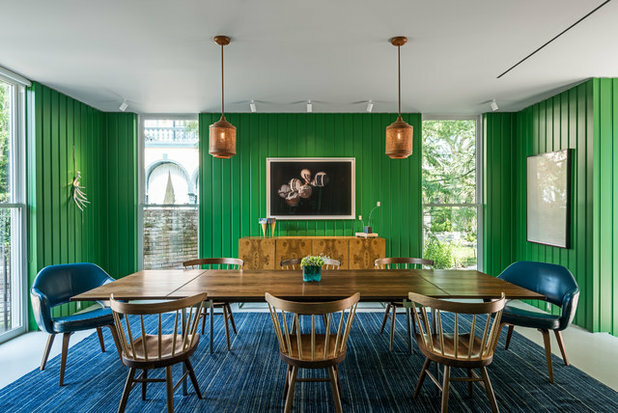 With its Kelly green walls and electric blue host chairs and area rug, this midcentury dining room in Houston isn’t shy about color. 48. 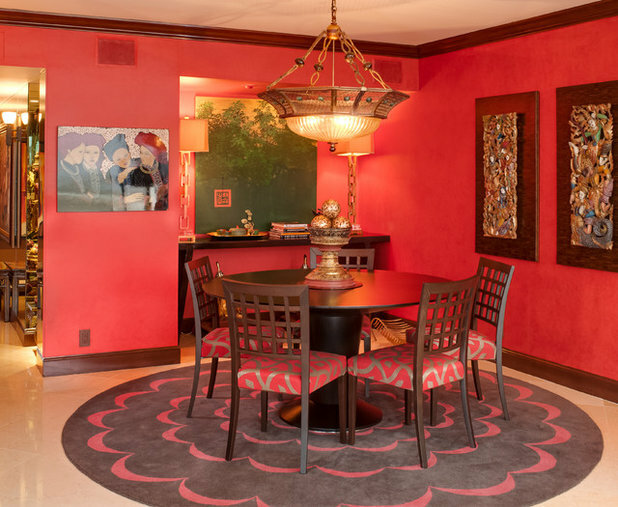 Red is the star player in this Asian-inspired dining room in Miami. 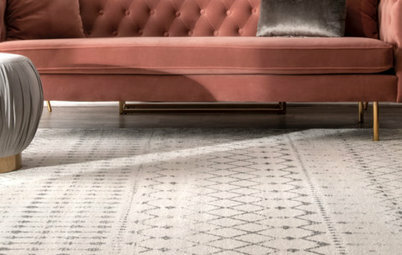 The walls, chair upholstery and round area rug are all in shades of crimson. 49. Two enormous wrought iron lantern chandeliers draw immediate attention in this Birmingham, Alabama, dining room. 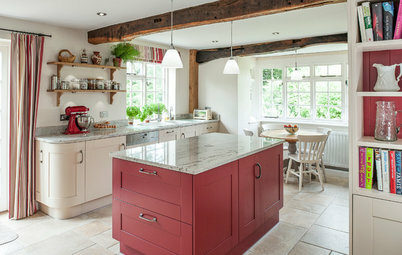 The two nearly floor-to-ceiling curtains can be pulled shut to separate the room. 50. 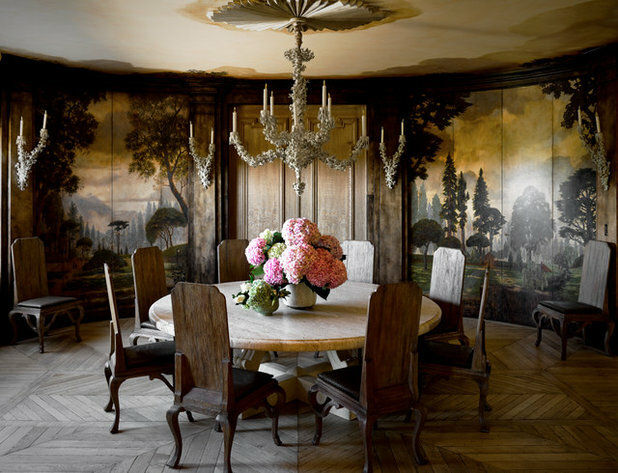 This round dining room in San Francisco features a custom mural of a wooded landscape. 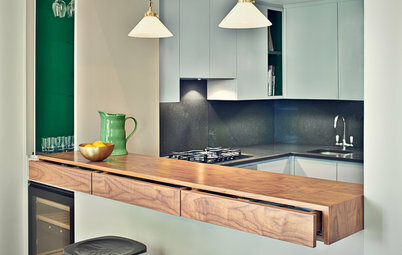 The dining table was made out of a solid slab of travertine. The only ones which were even vaguely nice were thirty thirty two and thirty four and maybe the last one but I think that mine is nicer than all of them. 16, 20, and 34 are right up my alley. The rainbow lights are way too much and the pic of MM holding her tat tas is hardly dining room appropriate. Love, love, love #14 Chicago. Fascinating and beautiful, a great place for a dinner party.